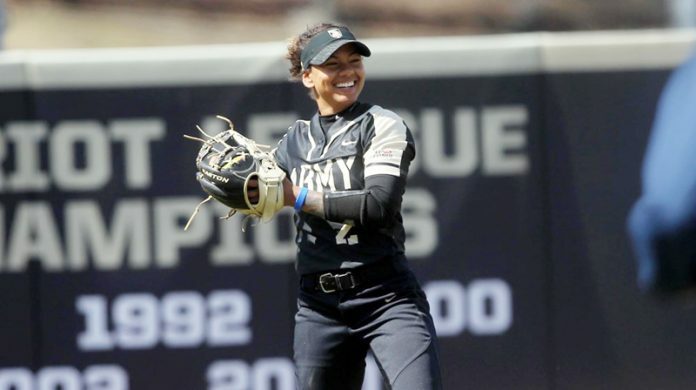 The Army West Point softball team split its first Patriot League double header of the season against Holy Cross. WEST POINT – The Army West Point softball team split its first Patriot League double header of the season against Holy Cross to earn a series victory at the Army Softball Complex on Sunday. Sophomores Taylor Drayton and Ally Snelling, along with senior Izzy Gates, led the Army offense with a hit apiece. Drayton provided the big blast with a solo home run, while Snelling doubled. In the circle, senior Renee Poirier tossed a complete game in the night cap, allowing just three hits and a run while not issuing a walk. Rookie Jolie Duong went 5.1 innings in game one and struck out five.